Nadine Le Prince Haveli- Nadine Le Prince bought the Nand Lal Devra Haveli which was constructed in 1802. She is doing great work in preserving and restoring heritage havelis throughout Shekhawati. Now also open cultural centre where different art work of French and Indian modern artists are shown up. Kala Dirga gallery exhibits contemporary art about India, Saraswati gallery exhibits painting having Rajasthan traditional themes, Patachitras and Madhubani are two small tribal art gallaries showing artistic work of tribes. Entry fee is Rs 50/- . Qureshi Farm- Its one of the project is conferred as top three humanitarian projects worldwide by UN. This live stock farm was constructed in 2011 and known for best research on breed development and maintains pedigree of Indian goats and sheeps. Jagannath Singhania Haveli– This haveli was built in 1860 and known for marvellous paintings of Radha-Krishan. Singhania haveli is 50 feet in height and has a special 9 door room. Other rooms of this havelis like Baithak, Bara Dari, Rangeen Kamra and Bhuran are known to have exclusive paintings work. Dwarkadheesh temple- Built in 19th century, it is famously known as ‘Asharam Temple’. Sons of Seth Asharam Ji Poddar constructed this temple in the memory of their father. This temple also has the murals which represents the famos Shekhawati wall paintings, well known as ‘Open Air Art Gallery’. 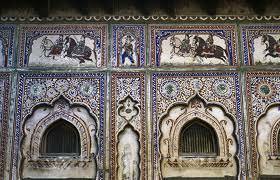 There are also other havelis which are well decorated with murals and paintings. By Road: Fatehpur is located at 50 km, 38 km, 49 km from Sikar, Churu and Jhunjhunu on NH 11. One can easily reach here by hiring taxi or by RSRTC bus from Sikar, Churu and Jhunjhunu. By Rail: Fatehpur is well connected through nearest Sikar, Churu and Jhunjhunu railway stations to major cities railway stations like Delhi, Agra, Mumbai, Chennai, Ajmer, Pali, Jaipur, Ahmedabad. By Air: Fatehpur can be reach through nearest Jaipur Airport (176 Km) which is well connected with regular domestic flights to Delhi, Mumbai.